1. Why should I care about the VIX? It provides important information about investor sentiment that can be helpful in evaluating potential market turning points. A smaller group of investors use VIX options and VIX futures to hedge their portfolios while other investors use those same options and futures as well as VIX exchange traded notes (primarily VXX) to speculate on the future direction of the market. 2. What is the history of the VIX? The VIX was originally launched in 1993, with a slightly different calculation than the one that is currently employed. The ‘original VIX’ (which is still tracked under the ticker VXO) differs from the current VIX in two main respects: it is based on the S&P 100 (OEX) instead of the S&P 500; and it targets at the money options instead of the broad range of strikes utilized by the VIX. The current VIX was reformulated on September 22, 2003, at which time the original VIX was assigned the VXO ticker. VIX futures began trading on March 26, 2004; VIX options followed on February 24, 2006; and two VIX exchange traded notes (VXX and VXZ) were added to the mix on January 30, 2009. 3. Why is the VIX sometimes called the “fear index”? The CBOE has actively encouraged the use of the VIX as a tool for measuring investor fear in their marketing of the VIX and VIX-related products. As the CBOE puts it, “since volatility often signifies financial turmoil, [the] VIX is often referred to as the ‘investor fear gauge’”. The media has been quick to latch onto the headline value of the VIX as a fear indicator and has helped to reinforce the relationship between the VIX and investor fear. 4. How does the VIX differ from other measures of volatility? The VIX is the most widely known of a number of volatility indices. The CBOE alone recognizes nine volatility indices, the most popular of which are the VIX, the VXO, the VXN (for the NASDAQ-100 index), and the RVX (for the Russell 2000 small cap index). In addition to volatility indices for US equities, there are volatility indices for foreign equities (VDAX, VSTOXX, VSMI, VX1, MVX, VAEX, VBEL, VCAC, etc.) as well as lesser known volatility indices for other asset classes such as oil, gold and currencies. 5. What are normal, high and low readings for the VIX? This question is more complicated than it sounds, because some people focus on absolute VIX numbers and some people focus on relative VIX numbers. On an absolute basis, looking at a VIX as reformulated in 2003, but using data reverse engineered going back to 1990, the mean is a little bit over 20, the high is just below 90 and the low is just below 10. Just for fun, using the VXO (original VIX formulation), it is possible to calculate that the VXO peaked at about 172 on Black Monday, October 19, 1987. 6. Can I trade the VIX? 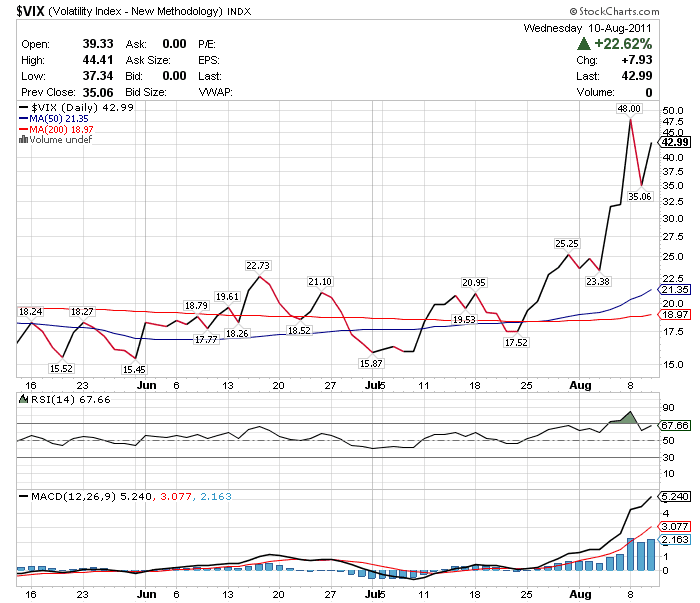 At this time it is not possible to trade the cash or spot VIX directly. The only way to take a position on the VIX is through the use of VIX options and futures or on two VIX ETNs that are based on VIX futures: VXX, which targets VIX futures with 1 month to maturity; and VXZ, which targets 5 months to maturity. An inverse VIX futures ETN, XXV, was launched on 7/19/10. This product targets VIX futures with 1 month to maturity. As of May 2010, options have been available on the VXX and VXZ ETNs. 7. How can the VIX be used as a hedge? The VIX is appropriate as a hedging tool because it has a strong negative correlation to the SPX – and is generally about four times more volatile. For this reason, portfolio managers often find that buying of out-of-the-money calls on the VIX to be a relatively inexpensive way to hedge long portfolio positions. Similar hedges can be constructed using VIX futures or the VIX ETNs. 8. How do investors use the VIX to time the market? This is a subject for a much larger space, but in general, the VIX tends to trend in the very short-term, mean-revert over the short to intermediate term, and move in cycles over a long-term time frame. The devil, of course, is in the details. Next Brace for Impact: U.S. About to Go Off a Financial Cliff!